I am not a Yankee by nature, given my third-generation immigrant heritage, but I consider myself a Yankee by nurture, in that I’ve lived most of my life in Connecticut or Massachusetts, I talk fast, and I’m not real friendly. I grew up hearing about the Pilgrims and the Revolutionary War. I thought everybody knew not to fire until you see the whites of their eyes, but when some people hear “Lexington” they actually think of Kentucky! Now I live in the Pacific Northwest, in Seattle, and it’s a whole other world. Of course, one thing the northeast and the northwest do have in common: the appalling and shameful treatment of the original residents of this continent. The crimes of imperialism stay the same no matter where you go. We moved to Seattle after a year and a half in the California suburbs and I was relieved to be back in a city. I love the industrial feel to this place; it’s all pine trees, warehouses, and fishing boats. Seattle’s history is fascinating and strange, and one of the best things I’ve done here is take the Underground Tour. Beneath Pioneer Square and Pike Place lurks the original downtown area—a buried city. The tour is spooky and strange, a seminar in bad city planning. Every time the settlers in this area had to deal with a crisis, they picked the most convenient and ridiculous solution they could come up with, and the mess they created is awe-inspiring. But while I strongly suggest you take the Underground Tour if you’re in Seattle, what I really want to recommend is a book that makes brilliant use of this dank and crumbling underground. Cherie Priest is a local. I really like her Eden Moore series but recently I was blown away by Boneshaker, the first of her Clockwork Century Steampunk novels. I never got into Steampunk, which is sort of a cross between Victorian England and the Wild West, with extra clocks. Does that about cover it? I don’t want to rain on anyone’s quirky fantasy niche, but it’s never struck a chord for me. As a result, I’m coming to this book pretty late, and I imagine most Steampunk fans have already discovered it. For those of you who don’t seek out fiction that features monocles and airships, may I present for your consideration: Boneshaker. This book makes me think I need to give the Steampunk genre another shot. 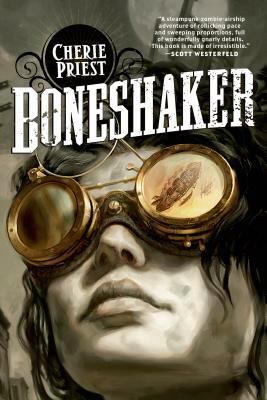 Boneshaker is the very best example of Steampunk I’ve ever seen or read. And! It has zombies. Cherie Priest makes brilliant and atmospheric use of the Seattle underground, setting her adventure in an alternate reality where downtown Seattle has been walled off to contain a poisonous gas that turns its victims into the ravenous undead. And people live there, behind locked doors, drop bridges, and airlocks, like a horror-themed space station. Naturally, there’s a mysterious history and some dark secrets and Dr. Leviticus Blue’s Incredible Bone-Shaking Drill Engine, for which the novel is named. The book also has a fantastic protagonist in Briar Wilkes, a woman on a mission in a trench coat and goggles. This is genre fiction at its finest, with nefarious bad guys, shocking reveals, and a spectacular, creepy atmosphere that Priest does exactly right. It’s also non-stop action. I have no idea why this book hasn’t been made into a movie. This book is published by Tor Books; get it and any other by Cherie Priest at your local independent bookstore or library and you won’t regret it.